The Bureau of Labor Statistics (BLS) reported the unemployment rate fell to 3.7 percent in September, the lowest rate since it hit 3.5 percent in December of 1969. BLS reported some slowing of job growth for the month as the establishment survey showed a gain of 134,000 jobs. This figure may have been somewhat reduced by the hurricane hitting the Carolinas. The job growth numbers for July and August were revised up by 87,000, bringing the three-month average to 190,000. Among the big gainers in this report were white women (20 years old and older), who had a 0.4 percentage point decline in their unemployment rate to 2.8 percent, the lowest on record. Black teens had a drop of 0.8 percentage points in their unemployment rate to 19.3 percent, also the lowest on record. By education level, less-educated workers appear to have been the biggest gainers. The unemployment rate for workers with less than a high school degree or just a high school degree fell by 0.2 percentage points, while the unemployment rate for workers with some college fell by 0.3 percentage points. The unemployment rate for college grads fell by just 0.1 percentage points. College grads, unlike those with generally less education, are one of the few groups with an unemployment rate that is higher than its prerecession level. Not all of the news in the household survey was positive. While the employment rate (EPOP) for prime-age women (ages 25 to 54) edged up slightly to 72.9 percent, tying its recovery high hit in July, the EPOP for prime-age men dropped 0.1 percentage points to 85.9 percent, 0.5 percentage points below the peak reached in February. There was also a rise in involuntary part-time employment of 263,000, while voluntary part-time fell by 317,000. However, these numbers are erratic and the rise in involuntary part-time may be partly due to the hurricane. Another disturbing item in the report was a drop of 1.8 percentage points in the share of unemployment due to voluntary job leavers. The 12.2 percent September rate is the lowest since February. The duration measures of unemployment also all showed increases in the month, with average duration increasing by 1.4 weeks to 24.0 weeks, the longest period since March. On the establishment side, job growth was strong in the goods producing sectors but very weak in the service sector. Construction added 23,000 jobs in September, a bit less than its average of 26,300 over the last year. Manufacturing added 18,000 jobs, while mining and logging added 5,000 jobs. Coal mining, however, lost 300 jobs. Employment in the coal industry is now 200 jobs below its year-ago levels. While employment growth was strong in these sectors, it was accompanied by a drop in hours. As a result, the index of aggregate hours fell in both construction and manufacturing, as did average weekly pay. On the service side, retail lost 20,000 jobs in September, while restaurants lost 18,200. Both drops could have been affected by the hurricane, which likely disrupted hiring in these high turnover sectors. Health care added 25,700 jobs for the month, almost exactly in line with its average for the last year. State education added 21,200, an extraordinary gain, since employment had been virtually flat over the prior year, although this may be partly a problem in seasonal adjustment. The movie industry lost 300 jobs in September. Employment in the sector is 7,900 below its year-ago level and 29,300 below the peak hit in October of 2016. In spite of the unusually low unemployment rate there is little evidence of wage acceleration. The year-over-year increase in the average hourly wage was 2.8 percent, that is down from 2.9 percent in last month’s data. However, the annualized increase in the average for the last three months (July, August, September) compared with the prior three months (April, May, June) is 3.4 percent. 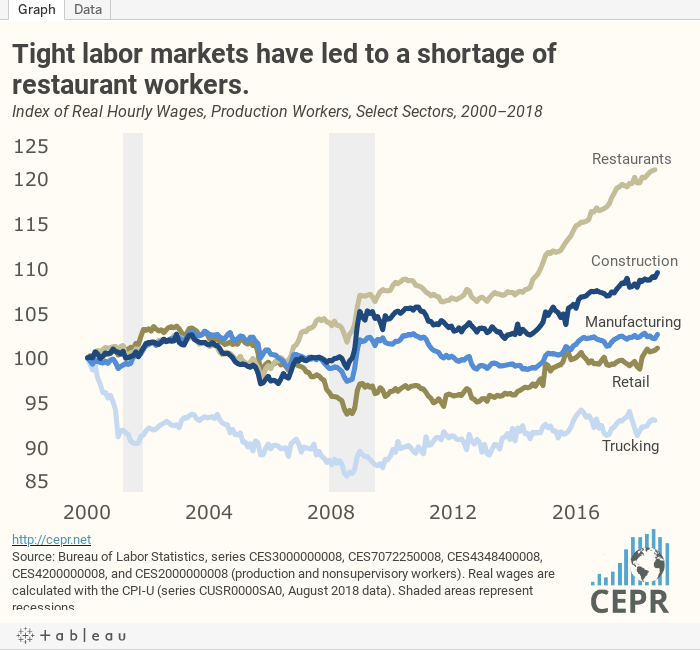 By industry, the strongest wage growth is in the low-paying restaurant sector, which has seen a 4.3 percent increase in the average hourly wage for production and nonsupervisory workers over the last year. While this likely reflects, in part, the tightening of the labor market, it also is partly due to increases in the minimum wage in many states and cities. On the whole, this is a healthy report with some notable anomalies, like the fall in the percentage of unemployment due to quits and the drop in hours. The lack of acceleration in wage growth suggests that the labor market can continue to tighten further.